“In my opinion, dancing is like drumming, like playing ney flute, or like playing piano, or like playing the oud, qanoon, or any other instrument. The instrument while dancing is the body. The dancer is a musical member of the orchestra” (Ramzy). What types of verbal utterances, sound cues, and musical linguistics do musicians and dancers use to communicate while making a show? What rules are fundamental to dancers to understand how to dance to live Egyptian music? Hossam Ramzy has created a formula, E=E, to explain how a dancer should follow the musical sound in Arabic music; in this theory each instrument has certain movements that go with it, and some that do not; similarly, certain rhythms have movements that predominate and others that are simply inappropriate to use. 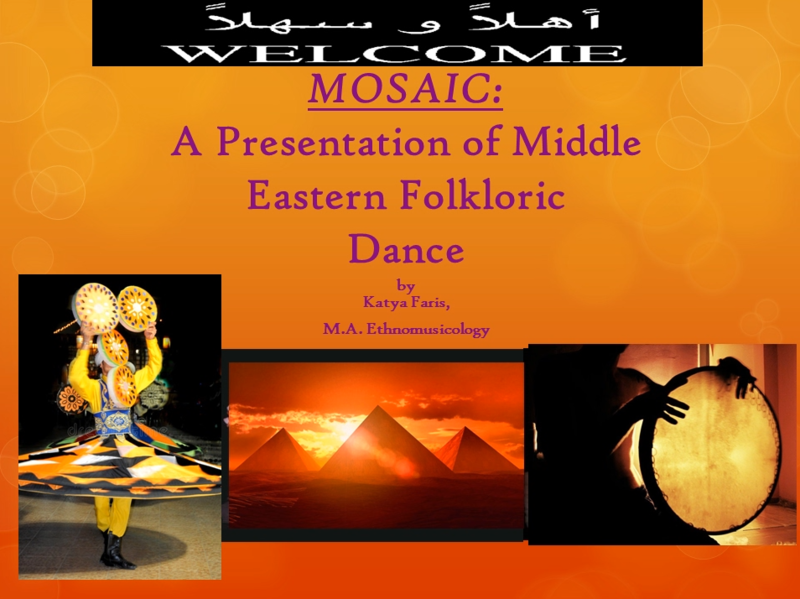 Interpretation of melody is seen as more challenging than interpretation of rhythm, because affectation is a very key component of Egyptian dance and music; “feeling” it like an Egyptian means learning the meanings of the lyrics, which is dependent upon the melody; this is called “Egyptian Angst”. 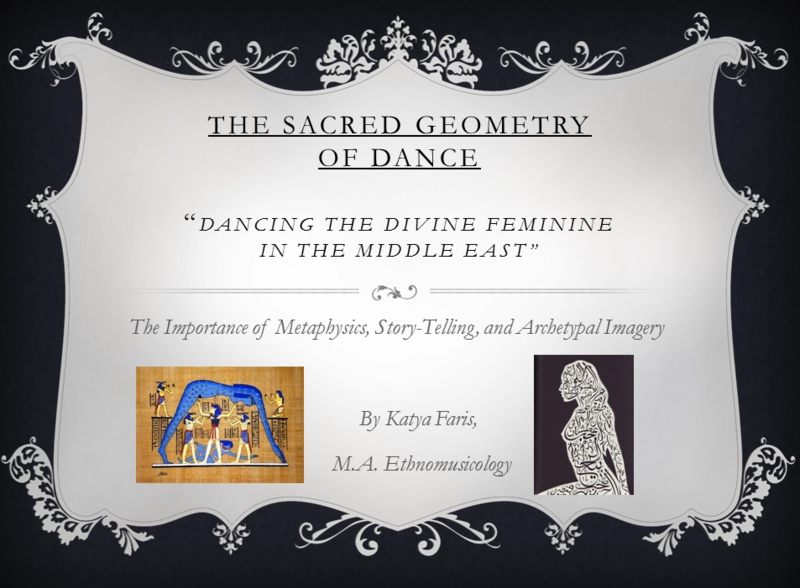 A Middle Eastern audience looks for this formula of movement matching the music, and if it is not present in the dancer, then her dancing is not considered “authentic”. According to this theory, it is all about the music, and making the sound visual. The style of music that comes from Cairo and is played for entertainment is considered secular, and is usually accompanied by a Raqs Sharqi dancer, or “Oriental” dancer. The highest form of this art is typically seen in public shows at 5-star nightclubs in Cairo, Beirut, Istanbul, and Dubai, to name just a few places. The musicians that play at these places vary from large orchestras with 15 violins in Cairo, to a small takht, or ensemble of five or less, in Beirut; they are considered the best of their field, and the dancers also are of the highest caliber. The only other related scholarship that I know of in this field is done by Dr. Anthony Shay at UC Riverside where he did his research on Iranian dance for his Ph.D. in Dance History. His area of interest is Iran, but he also covered areas of Eastern Europe, Turkey, and Central Asia, as well as some Arabic cultural dance forms. He has shown how in Classical Persian Dance one can see the calligraphic patterns of the written language of Farsi in the arm movements; the whole body can also represent a letter in Farsi. This follows Arabic language, because many Arabic letters were adapted into Farsi. Islamic art patterns employ the use of geometry, calligraphy, and the arabesque (circular shapes) (Shay). 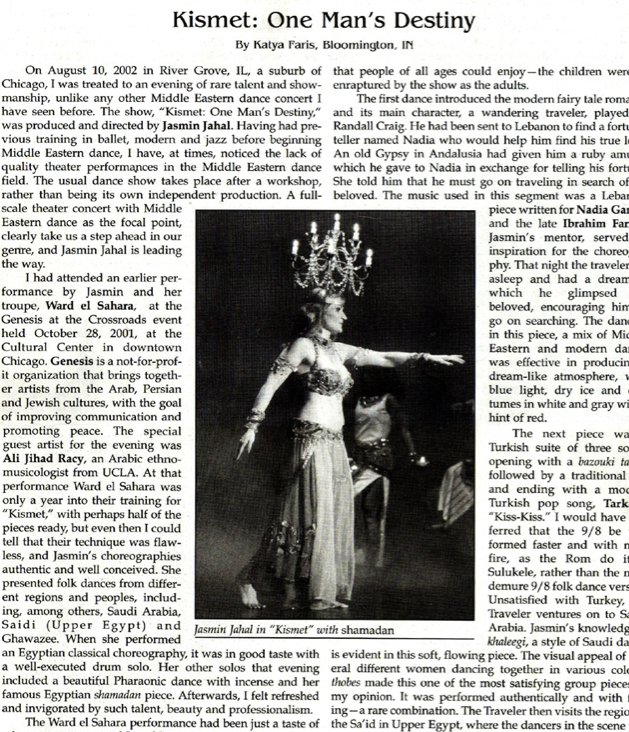 A performance by Egyptian Raqs Sharqi dancer, Randa Kamel, on YouTube is what I used for my sample transcription. It is of a synthesizer imitating a ney, or Arabic end blown flute, taqsim (improvisation), starting with a rhythm-based baladi style, and then going to a pure classical style with no rhythm. It is 1:07 seconds, and takes place in a Cairo 5-Star hotel with a live band. As the goal of all Arabic music is tarab, or ecstasy, I believe that the taqsim style of playing showcases this ecstatic tendency the best. According to Dina of Cairo, the most famous Raks Sharki dancer in Egypt today, “there is no 1-2-3-4-5-6-7-8 in real authentic Egyptian dance…it is all One” (Dina). As the taqsim is usually non-metric, the dancer must follow the musicians’ sounds, making the appearance that all of the movements flow together and are linked together. What structure must the dancer grab onto to follow the music? I want to explore Ramzy’s theory in relation to this video clip, and see if I can unravel the mystery of the “Formula” as Ramzy calls it, and the Egyptian Dance Code, as Sausan calls it through transcription and analysis. The structure of the taqsim is essential knowledge for the dancer in order for her to know how to dance, and so that she can understand where the sound is moving. In Islamic art practices the use of the Center is prevalent; also, in Sufism, the mysticism of Islam, geometric art patterns are employed to lead the eye of the onlooker to the center of the piece. Musical structure is no different; it asks the ear to follow the musical piece to the center, where the most precious secret is told in the music. The movements of the dancer must mirror this center, in spatial design and in movement isolation technique where the abdomen is the focus. I will explore the foundation of the taqsim and apply these theories of movement to Randa’s video clip. 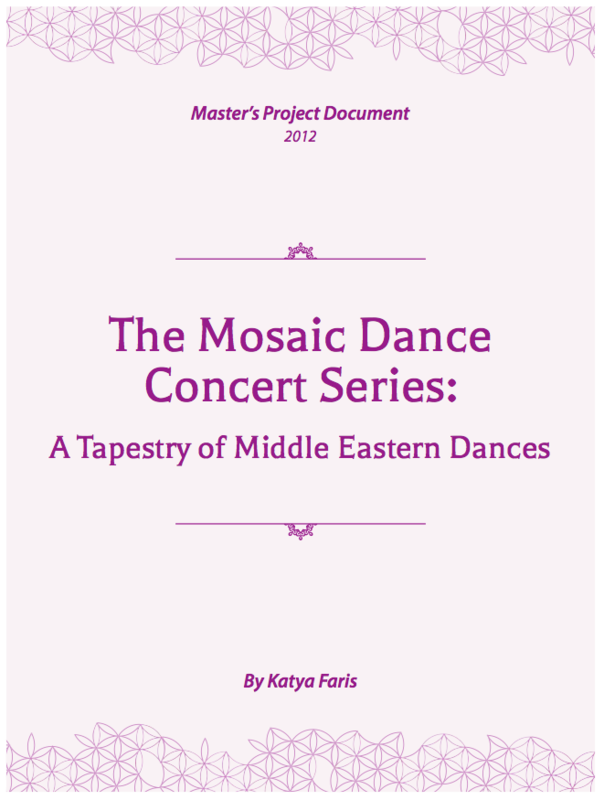 There is very little scholarly research done on Arabic dance, and I believe that anything written on this subject is well worth the time and effort, as there is a vast body of people being ignored by academia. As this dance form has been popularized into mainstream culture, I believe it is important to document its uniqueness within its own cultural context of its homeland. Issues of intertextuality and intercontextuality are very relevant to art forms such as Oriental Dance, because they cross so many boundaries, such as traditional vs. modern, and East vs. West. In this solo the synthesizer is imitating a nei, or bamboo reed flute. While it is aesthetically appealing to use the real instrument, it is very common in nightclub settings to have a synthesizer instead. Therefore, I thought this clip was a good example of a performance that is dependent upon its contextual factors in showing what the norm is of Egyptian Raqs Sharki in Cairo. The piece starts halfway through a measure, so I chose to start at the beginning of the next musical phrase. The first eight measures of this piece are done baladi style, or as a baladi taqsim with rhythm; the name of this rhythm is Saidi, meaning coming from the Said, or Upper Egypt. 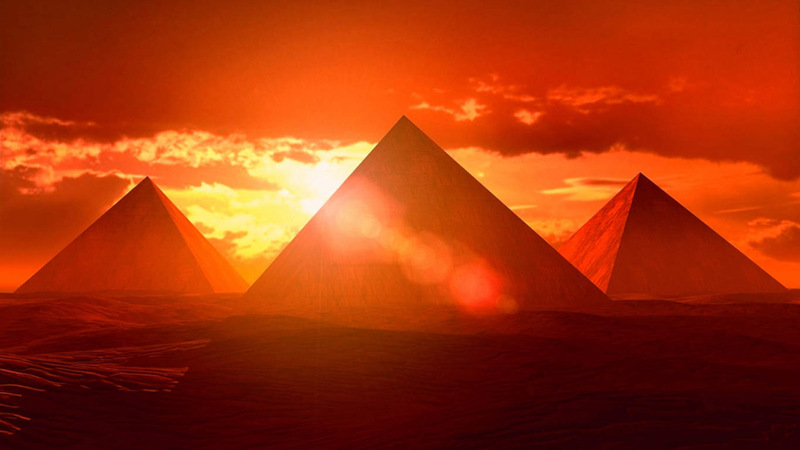 As the Nile is south of the equator, it flows north towards the Mediterranean; Upper Egypt is actually south of Cairo in the middle of Lower Egypt to the north, and Lower Nubia to the south. Arabic rhythms are read in “dooms” and “teks”; Saidi is “dum-tek-dum-dum-tek”, and it is in 4/4. The violin section is playing a call and response with the nei during the baladi, and then during the classical taqsim they drone on G. This means the baladi style of playing and dancing is from Cairo, and is an urban approach to the peasant woman’s dance. Many farmers, or fellahin, move into the city, and they bring with them their dance; this dance then changes with the discursive culture of the urban setting and borrows from many other genres to create a new style, baladi. It is always an improvised style, and varies from region to region in Cairo. Measures 9 through to the end are done without an implied rhythm, as it is considered a “classical” taqsim. The majority of both taqsims are done in maqam Kurd. Maqam Kurd is notes G, A flat, B flat, C, D, E flat, and F. Maqam Hijaz is notes B flat, C flat, D flat, E flat, F, G, and A flat. As the name implies, Kurd most likely comes from northern Iraq/eastern Turkey, and unlike most Arabic music, does not include quarter tones. 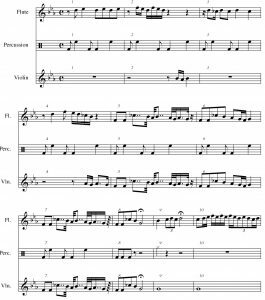 To the untrained ear, it sounds as if these quarter tones are present, but rather, it is the playing style of the pitch by the performer making this appearance. He is “bending” the sound so that the notes are strung together in a silky smooth fashion that makes the appearance that he is using quarter tones; this is mirrored in the dance movements as they blend from one to the next. It is common for music from Armenia, Kurdistan, and Azerbaijan not to use quarter tones, but Arabic music does borrow many scales from this area, because of the Ottoman influence. There are two maqam modulations in this piece; in measures 3 and 4 the musician goes from Kurd to Hijaz, and in measure 17 he goes to Ajam. However, it is important to remember that the general flow of a taqsim is one of an inherent climb, or ascent, an arrival, and then a decline, or descent back down the scale. The “arrival” point at the top does not necessarily mean that the performer is modulating at that point. Modulations can happen at different points in the piece, depending on the rules of whatever maqam is being played. When I looked at what dance movements were being executed when the modulations happened, I was a little disappointed. Then I discovered that indeed it is hard to anticipate when a musician is going to modulate into a different maqam, and that for the dancer, it is too sudden of a shift to catch it every time. However, the general idea of the improvisation being an inner journey with the ascent/descent of the scale was seen in the general flow of the movements. In measures 3 and 4 where the musician goes into Hijaz, she simply changes direction of the movement that she did in the phrase before to show the modulation; same movement, different direction. In measure 14 when the player is at the height of his musical ascent, she does nothing to show that they are at the top, other than that she begins with her left hip instead of her right in the middle of a longer movement pattern that links all the movements in a circular fashion. 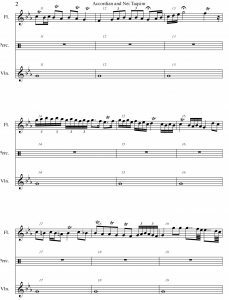 In measure 17 where the player goes into Ajam, again there is nothing that she does with her movement on a minute scale that shows the modulations. What she is doing, however, is showing the overall pattern of the notes. The idea of the sound being circular is present, and there is an implied rhythm like a heartbeat in the classical taqsim even though there is not supposed to be a meter. Her movements tended to be in 4-count phrases even though it was a non-metric improvisation. Her choice of movement technique highlights what Hossam Ramzy calls the “Formula”. For the nei instrument a dancer should use softer movements that include snake arms, figure=8’s with the hips and other body parts, whirling, turns and undulations; the famous “spiritual expression” should be present on the dancer’s face, as affection in Egyptian dance is essential. Very little “layering” of movements should be done with the nei, as adding a “shimmy” is the most common element of layering, and using a tremelendo, which would imply a shimmy, is not common with the nei flute. I felt this clip was a clear example of the movements as applied to the Ramzy theory; if I had not done this work I would not have seen things in it that I otherwise would have overlooked. Dina of Cairo. Dance Workshop with Little Egypt, Inc. Personal Communication. Miami, Florida, May 2005. Kamel, Randa. “Ney Taqsim” video clip. http://www.youtube.com/watch?v=iQN2fZUzE14 . Maqamworld. 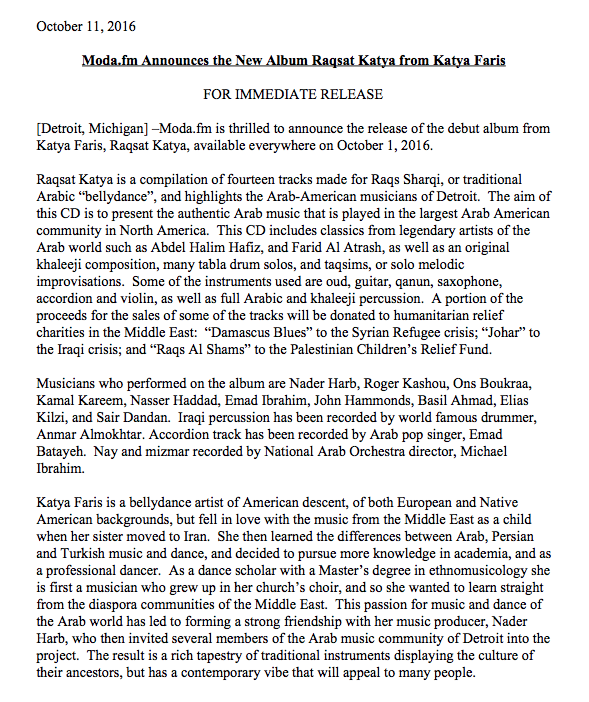 “Arabic Music Forms”. http://www.maqamworld.com/forms.html . Qureshi, Regula. 1987. “Musical Sound and Contextual Input: A Performance Model for Musical Analysis.” Ethnomusicology 31 (1): 56-86. Shay, Anthony. Choreophobia. Mazda Press. Los Angeles, CA. 1999.